Jeff is the founder and pastor of the Little Brown Mission Hub in Long Beach, CA. He’s also a professor of Old Testament and Hebrew for Fuller Theological Seminary. Previously, he was a teaching and lead pastor for over 30 years. His last church position ended with a painful exit. That prompted him to meet with a Spiritual Director and he began a healing journey that fostered a deeper intimacy with Jesus. Then he completed a certificate in Spiritual Direction with Soul Shepherding and the Lord called him into his urban ministry. Pastors, students, and ministry leaders love to hang out with Jeff in local coffee shops. 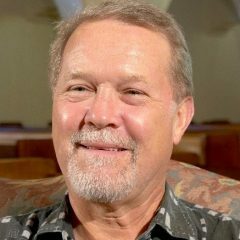 You can also find Jeff teaching the spirituality of Jesus from the Hebrew culture and language, feeding the homeless in the city, connecting Christian leaders from diverse traditions in the city, strumming his guitar and singing the Psalms in Hebrew or folk songs in English, or leading ocean trips on his sailboat. Jeff and his wife Barbara live in Laguna Niguel, CA and are new grandparents!